TAIPEI — The big three chipmakers — Intel, Samsung and TSMC — are likely to increase capital expenditures during the second half of this year while the rest of the semiconductor industry tightens the belt, according to a market research firm. The top-three companies will probably spend $20 billion for capex, representing a 90 percent increase from the first half of 2016, IC Insights said in a report emailed to EE Times on August 4. The companies will need to boost spending later this year to meet full year capex targets, according to the Scottsdale, Arizona-based company. The boost in spending is likely to widen the technology gap between the big three chipmakers and their smaller competitors. Samsung, Intel and TSMC are so far the only semiconductor companies to have announced plans to ramp up production of geometries in the 10nm range and adopt EUV lithography in the next few years. 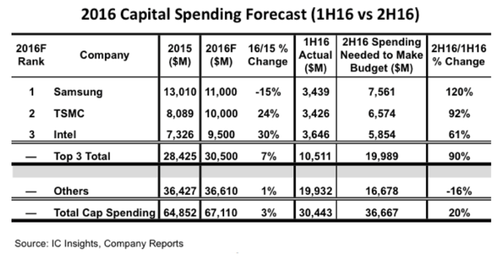 In total, IC Insights forecasts that semiconductor industry capital spending will increase by only 3% this year after declining by 2% in 2015. With many chipmakers moving to fab-lite business models and continued growth in fabless companies, wafer foundries have gone from representing just 12% of total industry capex spending in 2008 to what is expected to be 34% of worldwide capital outlays in 2016,according to IC Insights. Flash memory is the second largest industry segment for capex, projected to account for about 16% ($15.7 billion) of the total expenditures in 2016, the company added. —Alan Patterson covers the semiconductor industry for EE Times. He is based in Taiwan.